There you sit in the executive conference room, watching everyone nod their heads about the latest idea from the new executive on the block. He or she has a new idea that's going to "save the company" - it could be anything from a random Facebook campaign, live video, a series of Instagram Stories, a new Facebook group, maybe a years worth of random inspirational quotes to bump up the engagement to your Facebook Page. The sad thing is nobody in the conference room has the guts to state the obvious - that there's no budget, time, or resources, to implement the new random act of marketing or social media with any level of success. They start having nightmares of the budgets they're going to have to rob, the people they're going to tick off and the begging they're going to need to do to attain the necessary resources for this new plan. I like to call it a bad case of the RAMMIES. Scratching tasks and tactical to do items off your list may make you feel good. You may feel a sense of accomplishment. However, in reality, too much randomness in your business is a recipe for disaster. Random Act of Marketing - An attempt to grow market share, increase brand awareness, drive revenue or other business benefit that is NOT integrated, can not be easily measured or justified and does not integrate with other marketing and biz tactics. RAMMIES - Multiple RAMS, which often lead to wasted investment, little to no benefit in the form of brand awareness or revenue, and often lead to lay off, market share loss, gray hairs, stress, sleepless nights, mass consumption of chocolate or other high fat foods. We've all done them, seen them fail, and regretted them. It may start out as a simple Facebook Page, Twitter profile or LinkedIn group. The key is what may seem like a pointless little project could eat your ROI before breakfast and lunch. No defined metrics for success. 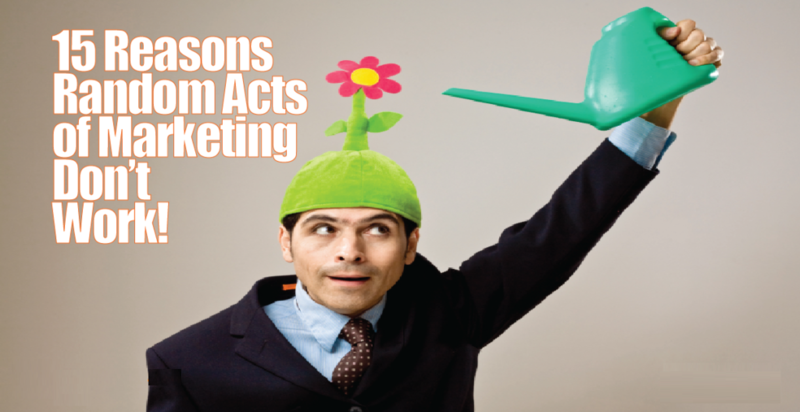 In this podcast, we'll go over 15 key reasons why Random Acts of Marketing (RAMs) don't work, and why your focus should be on sustainable, effective strategies which are both within realistic budget and capacity limits for your business.